'Toonist Bill Mitchell has located Al Gore's explanation for the temple fund-raiser. 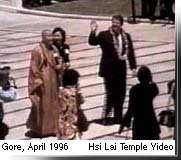 WASHINGTON (AllPolitics, Sep. 4) -- Two Buddhist nuns who helped coordinate an April 1996 temple fund-raiser attended by Vice President Al Gore admitted today they destroyed a list of donors and other documents because they thought the information would embarrass the temple. 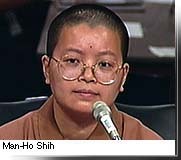 Man-Ho Shih, one of three nuns testifying today at the Senate campaign finance hearings, said she threw away a copy of her list of donors who gave a total of $45,000. Asked why, Man-Ho said, "I'm afraid the document might cause embarrassment to the temple." The temple's administrative officer said she destroyed other documents too, in Fall 1996 after news stories about the now-infamous Hsi Lai Temple luncheon appeared. Yi-Chu, the temple's bookkeeper, said she also destroyed documents and made new entries in the temple's books. "Developments were unfolding so fast that I was -- I really got nervous," she said. "See, I'm the bookkeeper of the temple, but I'm not a professional accountant. And for a lot of entries, I don't know how to deal with them. So I decided to destroy some of the documentation and make some new entries in the books." Both Man-Ho and Yi-Chu said they acted on their own, and not at the direction of anyone else. Tax-exempt religious organizations, like the temple, are not allowed to make political contributions. It is illegal for anyone to make political donations in someone else's name. Gore's appearance at the fund-raiser has proven a major embarrassment for the vice president, but he also faces new Justice Department scrutiny on another front: his 46 fund-raising calls from the White House. On Wednesday, the Justice Department said it was looking into those calls to determine whether his actions might trigger the appointment of an independent counsel to investigate. Republicans on the Senate committee said the nuns' testimony clearly showed law-breaking and an attempt to hide the true source of contributions. Sen. Arlen Specter (R-Pa.) said the nuns were used by Democratic operatives and became "sort of pawns in the whole operation." "You did something you didn't understand and you got caught up in a web," Specter said. "You tried to hide it ..."
At times, the Republicans on the panel seemed frustrated at the nuns' matter-of-fact description of reimbursing members of the order for their contributions. "There was a significant amount of money-laundering, and it was through the temple," Sen. Don Nickles (R-Okla.) told Man-Ho. "Do you understand that this is illegal?" "Well, if there's any illegal action, we regret it," Man-Ho replied. But she also appealed to senators to consider "religious differences" before they used terms like "laundering" to describe the temple's actions. Some Democrats on the committee argued that what looked like illegal reimbursements and campaign money-laundering was, in fact, simply the way the temple and its monks and nuns handled their money. Monastics at the Hsi Lai temple are not required to take a vow of poverty, and the temple routinely provides for their living expenses, including charitable donations, overseas travel and medical care. Sen. Joseph Lieberman (D-Conn.) called the temple episode "a terrible story," reflecting a out-of-control political system that extended its tentacles into a spiritual order, tainting and perhaps corrupting it. The nuns testified the temple fund-raiser was planned after a meeting between temple leaders and Gore in Washington in March 1996. They invited Gore to visit and he later accepted. Two Democratic fund-raisers, Maria Hsia and John Huang, helped to coordinate the event. Yi-Chu testified that after the luncheon, Huang said he needed a total of $100,000 to take back to Washington, so they agreed to try to raise another $55,000 from the order's monks and nuns. Yi-Chu said she approached people and asked them to give $5,000 each. Asked if she told them she would reimburse them with a temple check, Yi-Chu said, "I didn't tell them that was going to happen immediately..." But under questioning, she conceded they were either told or understood they would be reimbursed for their contributions. 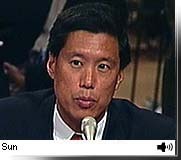 Asked by Democratic Sen. John Glenn whether any of the money came from foreign sources, Yi-Chu said, "Not at all." Committee members also pressed the nuns and their attorney on the whereabouts of a temple-commissioned videotape of the event. Thompson said he found it strange that the tape wasn't available, though Sun said it may have been sent to the order's international headquarters in Taiwan. "This looks a little strange, and I don't want it to look strange unless it's justified," Thompson said. The committee reconvenes at 10 a.m. EDT Friday, when it is expected to hear from Gore aide David Strauss. The panel began its hearings in July, then recessed for Congress' August vacation. It has a Dec. 31 deadline to complete its inquiry.  Focus On Gore: Can He Survive The Heat?